St. Ebba B & B sits over looking the sea on Mount Stuart Road. Comfortable and relaxed enjoy the wonderful views in our family run period Victorian home. 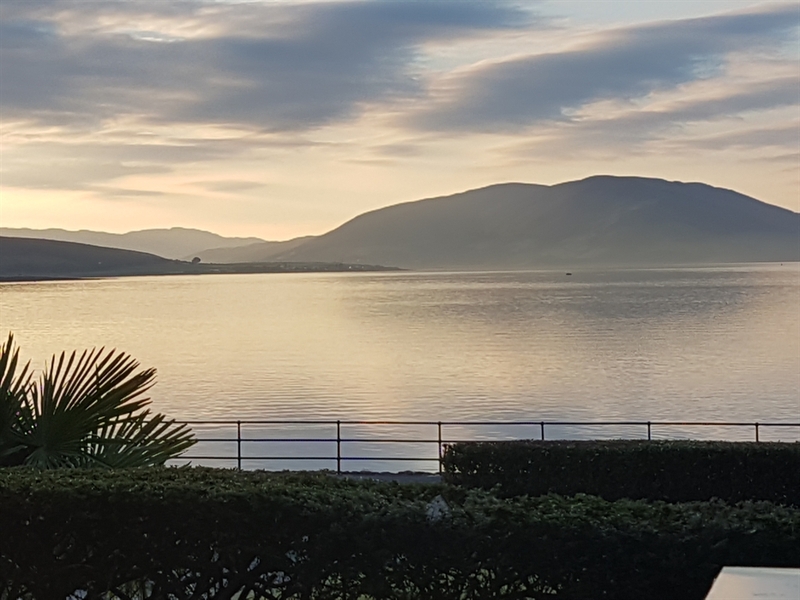 Enjoy the panoramic views of Rothesay bay, Loch Striven and the Cowal Peninsula while you have breakfast in our fabulous dining room. Many rooms have views of the sea including our relaxing lounge on the ground floor. We have a comfortable relaxed contemporary style that will suit most tastes. This is our family home and you will find a welcoming friendly Scottish atmosphere. All our rooms have full refurbished shower rooms/ bathrooms and are well equipped with welcome trays, TV, and hairdryers. Ironing board/iron available on request. Visitors have been arriving at Rothesay pier on the Isle of Bute for many hundreds of years to enjoy the simple relaxing environment. There are many boats of all shapes and sizes over the summer months in the harbour area including the last ocean going paddle steamer 'The Waverly'. Traditionally many paddle steamers would arrive daily at the many piers on the island bringing bustling tourists ashore. There is a fantastic view of 'The Waverly' from the St Ebba sailing past into Rothesay pier almost daily over the summer months. The St.Ebba is a grand Victorian villa with many original features and panoramic views across Rothesay Bay. It sits on Mount Stuart Road and to find us you take a left turn from the ferry towards Kilchattan bay. If you are on foot it is a pleasant 15minute walk. There is a taxi rank at the pier and local bus services. Since March 2010 we have been transforming it into our family home and we have been sharing it with our 'Bed & Breakfast' guests since July 2011. It has a comfortable contemporary style which blends well with the traditional feel of Scottish holidays in Rothesay. You will find a friendly relaxed atmosphere to enrich your stay. You may want to relax in the lounge of the St.Ebba in front of the log stove and enjoy the fabulous unrestricted views across Rothesay Bay on to the Cowal Peninsula and Loch Striven. On warmer summer evenings you can enjoy the magic of sitting in the garden in front of the house and soak up the all the activity on the water and watch the wonderful sunset. The guest rooms a pleasant mix of traditional comfort with modern conveniences. All en suites have been tastefully refurbished to a high standard to suite todays guest's needs with 'Scottish fine Soaps' toileteries. All rooms have their own shower rooms or private bathroom. Most are en suite with one room having its private bathroom located directly opposite the bedroom. All rooms are of a high standard of decorative style, fresh light and airy. They are all well equipped with welcome trays, freeview television, WI-FI, hairdryer. 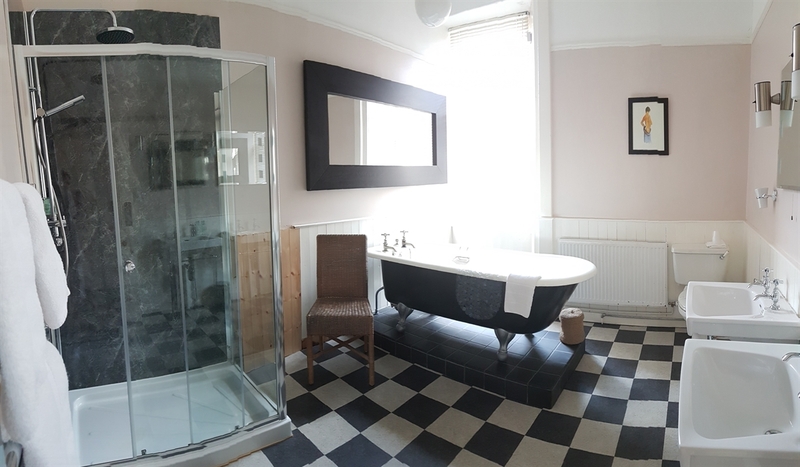 We also have a spacious ground floor room with large ensuite shower room that may suit those guests who would rather not have stairs or require to use a wheelchair. We can cater for a wide range of visitor business or pleasure. All rooms have good quality WIFI. A range of tarriffs. The rooms available are for couples, singles, twin rooms and families. Families with small children we can provide travel cot and high chair. Spending time at the St.Ebba in Rothesay will allow you to experience a taste of island life and enjoy activities such as cycling, walking, horse riding, fishing ,golf and sailing. there are local attractions such as 'Mount Stuart Estate,'Rothesay Castle, the 'Victorian Fernary' and the Isle of Bute Discovery Centre is a good place to start. This is Visit Scotland's tourist information centre. You will find local maps, history, events and lots more. There are various events throughout the year such as the Butesong, Butefest music festival, Vintage car and tractor events, Bute Highland Games in August, crime writing festival, Line Dancing, Cycling events and 'Eat Bute' local food and drink festivals.